We get so many success stories from our homes in India, it’s sometimes hard to share them all! We’re very proud of the fact that our homes, projects, and fundraising have such an impact upon the lives of the children and families that we are able to help. We see young children grow up to become young adults with the skills, education, and opportunities to be successful in modern day India. It’s often easy to forget that these individuals are the same ones who ten years ago entered the homes with such saddening and troubling stories. Here we have two stories, that of Sivakumar and Anbarasi, which show the difference your support can make. To find out how you can help us support more children and young people like them, click here to go to our support us page. Sivakumar’s father was a farm labourer, but didn’t own any land, he worked in the fields for daily wages. He died of jaundice when Sivakumar was only 2 years old. Sivakumar’s mother became a widow when she was in her early 30’s with 3 small children. She suffered a lot with the sudden demise of her husband, who was the bread winner of the family. She started to go to work in the fields with her young family. She worked hard but earned very little, and it was just not enough to bring up her children. She was not able to provide food, clothes, education for her three children, so in 2006, after years of struggle, she brought Sivakumar to Joy home when he was 10 years old. 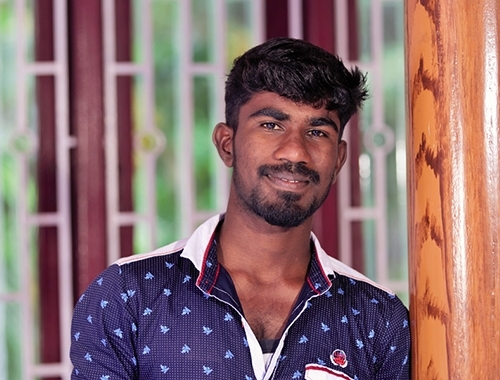 Now Sivakumar, age 20, has grown up into a happy and intelligent young man. He has successfully completed a Bachelor of Arts in History, and is looking for a job. He wants to pursue higher education in Law, and eventually become a Lawyer, but he needs a job to fund this. Anbarasi is from a very poor family, far below even the Indian poverty line. Her father left the family when the three children were little, and their mother struggled with mental health problems. The children were left alone with no one to provide even food for them. They lived in their damaged thatched hut, without food, for days on end. Finally, their Grandmother brought the children to Joy Home. Anbarasi was just 10 years old, accompanied by her sister Fradilla (age 9) and their brother Ravi (age 7). When they arrived, in 2008, they were weak, malnourished, withdrawn and emotionally distraught. Joy Children’s Home gave them hope and peace. With the loving care of the staff, and the friendly environment provided by their pleasant and homely shelter, the three children began to thrive. Now, with lots of love, affection, and care, they have grown up as lovely young people, facing the future with hope and boldness. 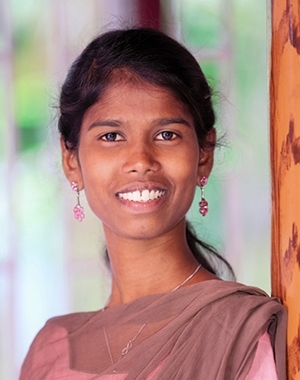 Anbarasi has successfully completed her Bachelor of Arts in English Literature, and she now wants to pursue her MA.